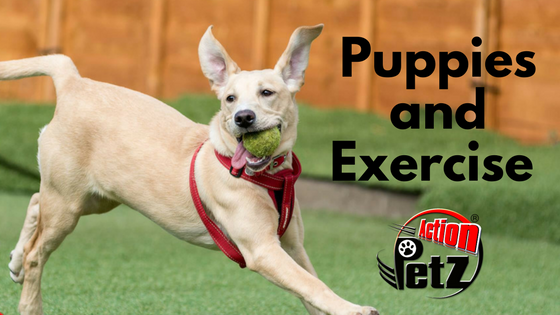 Exercising your puppy: how much is too much? An Action Petz guide. Puppies and exercise: how much is too much? Your puppy is home: you’ve got the bed, the food, the treats, the adorable puppy toys, collar and lead to match. You’re ready! And then it dawns on you: how much exercise does my puppy need? We know you were dreaming about long walks in the countryside, or a funky stroll with your pup in the city. However (and as frustrating as this sounds), this may prove too much for a young pup. Too much exercise and you could end up permanently damaging your pup’s bones. Growth plates are soft areas located at the ends of the long bones in puppies and young dogs. Their job is to be filled with cells that allow your puppy’s bones to become longer and dense; the way these cells work is by dividing themselves until they fill the growth plate. 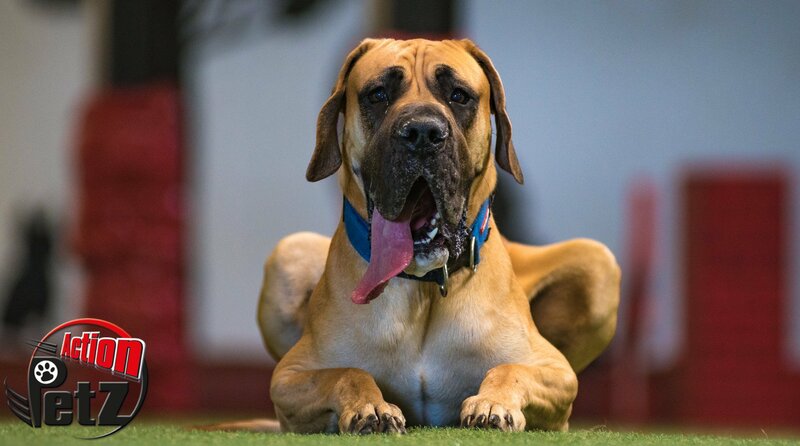 Once your puppy fully matures (usually around 18 months or longer for giant dog breeds), growth plates close and become a stable part of the bone. Too much exercise can be risky for a puppy’s growth plates, if an injury occurs these cells might slow down their growth or simply stop growing. So, while 3 of your dog’s legs a growing at a normal, healthy rate, the remaining leg might not fully do so causing future issues such as uneven pressure and a predisposition to arthritis. The five-minute rule seeks to prevent damage a puppy’s growth plates while still providing your pup with an amount of exercise that is suitable for their age. As we said above, puppies need exercise, but not the way we think they do. According to The Kennel Club, the five-minute rule works by assigning five minutes exercise per month of age (up to twice a day) until the puppy is fully grown. 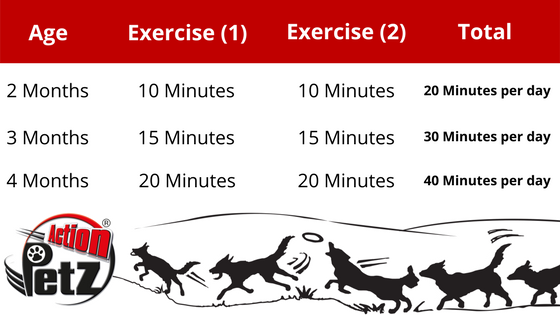 Once fully grown, your dog can exercise for a longer amount of time. LARGE AND GIANT DOG BREEDS: TAKE IT VERY EASY! Gentle exercise only until they are mature (around 12 months in Labradors and up to 18 months old in giant breeds). Exercise should be consistent, only mild to moderate exertion, mostly lead walking. Avoid: ball chasing, active playing with other dogs (gentle and controlled play is allowed) and sharp turns. These all put added pressure on the joints. THAT DOESN’T SOUND LIKE A LOT. MY PUPPY DOESN’T STOP! For the owner of a lively pup, the five-minute rule might sound a bit… too little. However, we must remember that for a puppy to grow up into a happy, healthy and well-adjusted adult dog, we must provide more than physical exercise. If your puppy seems to be a continuous bundle of energy, here’s a few tips that involve little to zero physical exercise whilst still providing your pup with learning experiences and really helping to tire them out. Hayley Rees, our dedicated puppy trainer at Action Petz Newport very accurately points that, dogs that use their minds more can often be calmer overall and get up to less mischief! Basic training: mental stimulation can be as tiring as a long walk. Puppy training classes (and then practising what you learn at home!) are a great way to keep your puppy busy without over exercising him. Let your puppy explore: pups are curious by nature, satisfy your pup’s curiosity by going into a supervised adventure around your house and the garden. The only thing to remember here is: no jumping! Stairs, jumping on and off beds/chairs/etc should not be allowed as it can affect your pup’s growth plates. Scent trails: place your pup’s food or favourite treats in a room and let him use his nose to find them. Always remember to supervise your pup and not let them into any potentially dangerous situation.